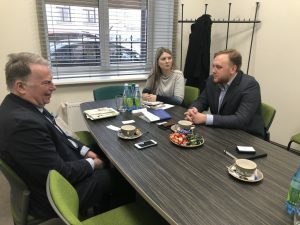 On March 13, 2019, Oleh Holovko and Mykhailo Vikhliaiev, members of the Executive Board of the Center for Ukrainian and European Scientific Cooperation, visited the Baltic International Academy (Riga, the Republic of Latvia). The meeting was scheduled in order to establish international partnerships with the Baltics countries and higher education institutions. The Baltic International Academy (BIA) was established in 1992 and is the largest non-government higher education establishment in Latvia amounting 4,500 students, including more than 450 foreign students from 22 countries worldwide, that creates a multicultural environment in Academy. Reorganisation of educational process takes place in the Baltic International Academy, which provides academic and professional higher education in accordance with the requirements of the European Union. BIA acquired positive international expert evaluation and gained no-term accreditation. The Baltic International Academy has branches not only in Riga but also in other Latvian cities (Daugavpils, Liepaja, Rezekne, Jekabpils, Ventspils, Smiltene, Jelgava). Inta Buka, Vice-Rector for International Cooperation, and Inna Stetsenko, Vice Rector for Scientific Affairs, met members of the Executive Board of the Center within the academy and told about the history of the academy’s foundation, peculiarities of the educational and scientific process of the educational institution with great relish. During the meeting, special attention was paid to the most urgent issues of the scientific environment both of the Republic of Latvia and Ukraine, and as a result, the parties agreed upon joint scientific projects in the future. The possibility of organising joint international scientific and practical conferences and scientific and pedagogical internships, writing collective monographs devoted to the topical and important issues of psychological, philological, social, legal sciences, etc. was discussed. 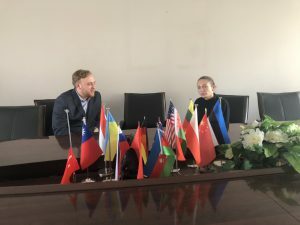 Representatives of the Baltic International Academy presented scientific periodicals and invited Ukrainian scholars to take the roles of authors and members of the Editorial Board. On this day in Riga, members of the Executive Board of the Center for Ukrainian and European Scientific Cooperation also met with representatives of another educational institution of the Republic of Latvia – Vidzeme University of Applied Sciences. Although the university is located in Valmiera, Agnese Dāvidsone, the Head of Communication, Journalism and Governance study programs, Dr.Phil, and Atis Kapenieks, Academic and Vice Rector for Scientific Affairs, Dr.Phys, managed to find time for meeting with the members of the Center’s Executive Board while were being in the capital. Thus, representatives of Vidzeme University of Applied Sciences said that it was founded in 1996, and in 2001 was granted the status of a state higher education institution. Atis Kapenieks, Vice Rector for Scientific Affairs, noted that the main goal of the university is the development of professional abilities in teaching academic and professional higher education and improving the research center. According to the representatives of Vidzeme University, it is possible to educate and graduate top-notch professionals due to the above objectives.